June 14, 2016 June 14, 2016 Dan O. Animals lose their kids, too. It’s not just humans. Marlin (Albert Brooks) is an obsessively overprotective Daddy clownfish, but with good reason. Some time ago, when he and his late wife had just welcomed all of their children to the sea, because they weren’t paying enough attention, somehow, they all got swept away, and the wife died. There was one left, however, and it turned out to be Marlin’s sole child: Nemo. And needless to say, yes, Marlin is very uptight and worried about Nemo, so much so that Nemo himself feels as if he needs to venture out there into the world a whole lot more than he’s allowed to. However, all of that adventuring gets Nemo caught by a bunch of humans and thrown in some dentist’s office fish-bowl. For Nemo, this is a new world, but it’s one that he doesn’t quite love just as much as he loves the sea. But Marlin will not stop until he finds Nemo and brings him home safe, once and for all – now, though, he’s got the help of a fellow fish, Dory (Ellen DeGeneras), who may actually be more of a problem than a solution. How I imagine Albert Brooks and Ellen DeGeneras talk to one another in real life. Finding Nemo came out at a time for Pixar that was definitely crucial. They were still hitting it out of the park with each and every flick they offered, but by 2003, you could start to tell that maybe, just maybe, Pixar’s appeal was starting to wane. Sure, a sequel to Toy Story works perfectly, because who doesn’t love talking toys, but talking sea-creatures? And one that involves one fish being lost and, hopefully, found? Well, regarldess, none of this talk matters. Finding Nemo wasn’t just a hit commercially, but it also showed that everything Pixar was able to do with their first couple of movies, they were still able to carry-on with and remind everyone that they were the voice and brand-name to be reckoned with when it came to the world of animation. Nowadays, it seems as if they’ve fallen a tad off the ladder, but still, Finding Nemo, as it still lies, works. The visuals, for one, are as beautiful as they ever have been. Given that the story literally takes place under the sea, it only makes perfect sense that every bit of Finding Nemo be as eye-engaging and beautiful as the bit before it. Heck, even after it being over 13 years of this thing being out and about, you’d think that at least some portion of it looks dated, or doesn’t quite hold-up; technology has, believe it or not, gotten a whole lot better and Pixar has definitely shown this. But nope, it’s still a beautiful movie. And I’m not just talking about the visuals, either, although they are quite great to look at. The greatest aspect of Finding Nemo is that it wears its heart on its sleeves practially the whole way through. It all starts off somber, tragic and absolutely upsetting for the first five minutes, but sooner than later, turns into this pleasant, relatively sweet story about overcoming one’s fears, adversities, and own handicaps to get something in life, as well as making one’s self better. While, yes, you could most definitely chalk that same message/theme to every other Pixar movie ever released, the fact remains that it still works and hits close to home here, even if you also get the idea that maybe Pixar wore it on a bit too strong? Then again, maybe not. What Finding Nemo works best in is that it allows for its story to hit the emotional archs and all that, but also bring on the funny, too. There’s so many silly and lovely side characters that, honestly, it’s not hard to want to see a movie about them. There’s the sharks going through AA for blood; there’s the sea turtles who live the rock ‘n roll lifestyle like bro-ish surfers; and most especially, there’s the sea creatures stuck in a fish bowl who want nothing more than to escape this unforgiving prison. 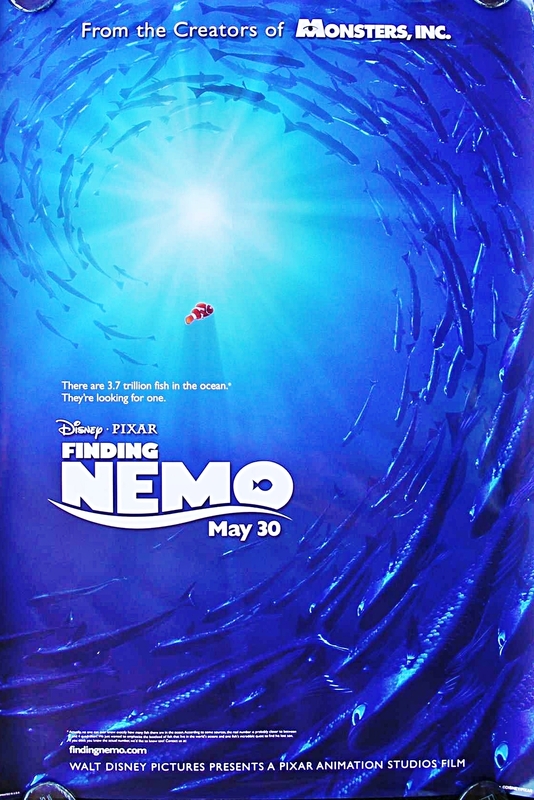 Of course, Finding Nemo gives all of these characters their chances to shine, but what matters most is that none of them feel like throway gags that Pixar thrown in there to create more toys, or because, well, they were bored; each and every character serves a greater purpose to the story and helps it move along. And yeah, while I’m on about the characters, I might as well say that the voice-casting is probably the ballsiest, yet, smartest bit of casting Pixar has ever done. Albert Brooks’ gruff, yet slightly neurotic voice is perfect for the overly neurotic and scared Marlin, who is easy to warm up to, especially since we know that Brooks is such a lovely presence on the screen. But it’s strange that he was cast in the role, because honestly, he wasn’t all that big at the time of this release; it’s hard to say if Finding Nemo helped revitalize his career (he’s not on the screen at all and half the people who saw it probably have no clue who Albert Brooks is), but hey, if it’s a role that utilizes him well, then so be it. But really, the star of the show is Ellen DeGeneras’ Dory. Now, despite this too being a voice-role, Dory’s the character that definitely regenerized DeGeneras’ career for the greater good of society. The character allows for her to get as high-pitched and silly as she wants, without ever seeming as if she’s over-doing it to a huge exteme. In fact, it’s the right bit of goofiness and charm that works well for this character, as well as DeGeneras, because even if we do want to strangle Dory at times, it’s still hard not to want to see her and be around her more. Probably why she’s getting her own flick, now that I think about it. Consensus: Just as you’d expect from Pixar, Finding Nemo is a heartfelt, sweet, honest, fun, and downright hilarious tale of adventure, family and love, which is what makes it all the more great.